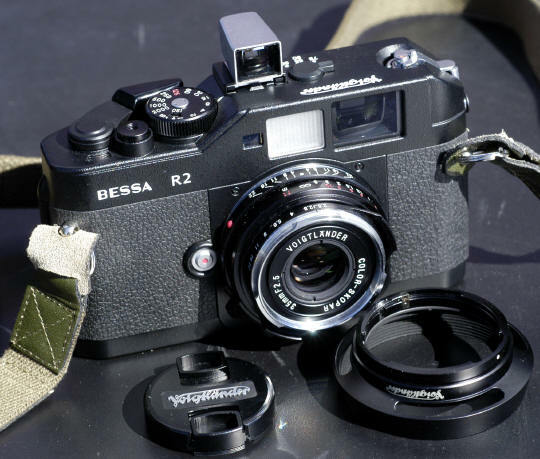 tiny 28/35 Mini-finder, 35/2.5 Pancake Type II, LH-4N bayonet on lens shade, and new style clip on lens cap. The 28/35 Brightline Mini Finder weighs in at an amazing 19grams. It has .5 Magnification, and with a minus .5 Diopter adjustment, 5 elements in 5 groups. Both the 28 and 35 brightlines are visible at all times. Chrome and black versions will be available. 2008: the 28/35 Minifinder was discontinued and is now getting very hard to find. DISCONTINUED 2009 - NOW HARD TO FIND! The new 35/2.5 Pancake Type II has the same optics as the its screw mount cousins, the 35/2.5 C and the 35/2.5 P I. Using 7 elements in 5 groups with 10 aperture blades, it weighs in at only 134 grams, 39mm filter size, measuring 55mm wide by 23mm long. The rangefinder coupled focusing goes down to .7 meter. 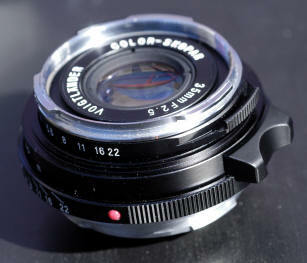 Physically the lens and shade are styled much like the Leica pre-aspheric 35/2 Summicron, even down to the focusing tab and aperture controls. 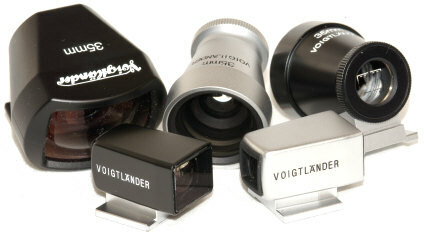 The bayonet mounted LH-4 (and its successor the LH-4N) vented lens hood will also fit the Voigtlander 50/2 Heliars. The new snap on 39mm cap will likely prove popular for other lenses as well. 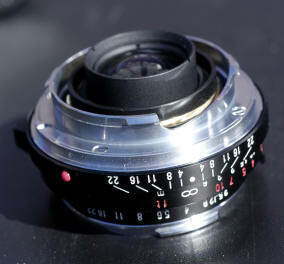 The Las Vegas 2004 PMA also introduced the Voigtlander 35/1.2 (Version 1) and a new kind of rangefinder called the Epson R-D1. Revised: September 10, 2017 . Copyright © 2004-13 Stephen Gandy. All rights reserved. This means you may NOT copy and re-use the text or the pictures in ANY other internet or printed publication of ANY kind. Information in this document is subject to change without notice. Other products and companies referred to herein are trademarks or registered trademarks of their respective companies or mark holders.